“A lot of us let ourselves, let the team down and let the jersey down,” Soliola said. Photo: Supplied by Canberra Raiders. After coach Ricky Stuart’s scathing assessment of the side’s performance against Manly, the Canberra Raiders are wanting to show how tough they really are. Stuart labelled the side “soft” in the post-match press conference after the Sea Eagles ran in four tries in the first half to set up the victory. 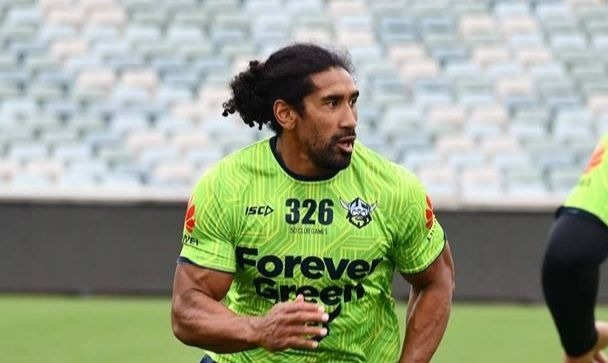 Canberra forward Sia Soliola admits the Raiders’ performance against the Sea Eagles on Saturday was not up to standard and Stuart’s comments were accurate of the side’s performance. “A lot of us let ourselves, let the team down and let the jersey down,” Soliola said. The Green Machine will have their worst start to a season in 36 years – since their inaugural season in 1982 – if they lose to the Bulldogs on Thursday night. The Bulldogs have also had a poor start to the season, with their only win coming against the Penrith Panthers in round three. Soliola said the home side are eager to give back to their supporters and are ready to battle the Dogs, who are aiming to bounce back from a loss to South Sydney on Good Friday. “We’re just thinking about this week and the Dogs, they’re a tough side and after the way they went down on the weekend, we know what’s going to come,” he said. “All of their forwards will be coming from the car park and they’ll be really getting into us. Stuart has dropped State of Origin star Josh Papalii for a must-win match against the Canterbury Bulldogs at Canberra Stadium on Thursday night, while Jack Wighton has survived the axe despite an ongoing investigation into an alleged nightclub incident. Canberra Raiders vs Canterbury Bulldogs at GIO Stadium, Thursday 7:50 pm. Tickets available from Ticketek.